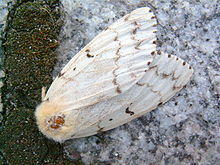 State forestry officials are proposing to expand the quarantine against the gypsy moth to all of Maine. That would make it easier to transport wood products through the state. State Horticulturalist Gary Fish says many people who testified at two public hearings on the issue said they would prefer to see the entire state under quarantine, even though some areas might not be infested. “When you have a partial state quarantine, wherever that quarantine line is drawn, the person that might be, for instance, cutting wood inside the quarantine cannot move it outside of the quarantine without special precautions,” Fish says. The USDA calls the moth one of North America's most devastating forest pests. Written comments on the statewide quarantine proposal are being accepted until April 26.